At a NATO-Russia Council meeting in Brussels, the Russian Minister of Defense Sergei Shoigu offered the international community assistance in destroying Syrian chemical weapons and expressed his hope to resume Russia-NATO dialogue on ABMs in Europe. Last week, Brussels hosted a meeting of the NATO-Russia Council (NRC) — the first such meeting attended by Russia's current defense minister, Sergei Shoigu. The minister voiced some new ideas aimed at making a substantial contribution to the fight against international terrorism all over the world, including Afghanistan, from which NATO will have pulled out the bulk of its forces by 2014. These ideas were welcomed by all the members of the NRC. Russia is already training Afghan Air Force specialists and policemen specializing in drug trafficking. Shoigu has also proposed a similar program of training for Afghan mine clearance specialists. On the one hand, such a program will help to rid Afghanistan of mines and unexploded munitions. On the other, it will provide decent employment for large numbers of young Afghans who might otherwise choose to join terrorists. Minister Shoigu offered the international community the assistance of Russian specialists in destroying Syrian chemical weapons. He also expressed his hope that the joint project of secure and environmentally safe destruction of old munitions in Kaliningrad Region will enter a practical phase next year. The project relies on technologies developed in NATO countries. Cooperation between Russia and NATO is not limited to the plans agreed upon or discussed earlier this week in Brussels. 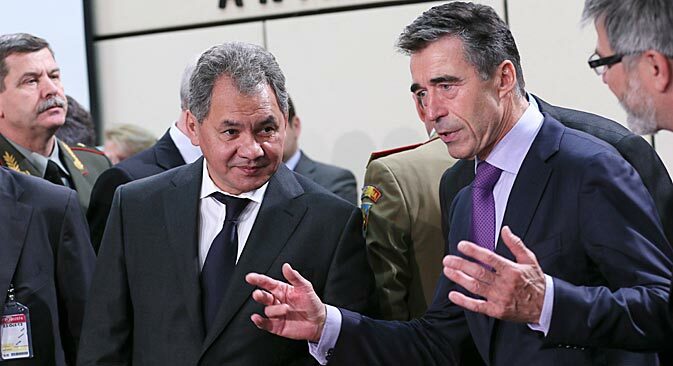 Speaking at a briefing for Russian journalists prior to the NRC meeting, NATO Secretary General Anders Fogh Rasmussen said that, lately, there has been more openness, predictability and trust in the relations between Russia and NATO. Rasmussen praised the transparency of the Russian armed forces during the Zapad-2013 military exercise, which was attended by more than 80 representatives of foreign countries, including NATO states. He also pledged the same level of transparency during the NATO exercises that are to be held in Poland and the Baltic states in early November. Speaking at the NRC meeting, Shoigu did, however, complain to his NATO colleagues about the fact that the scenario of the upcoming exercise includes an attack against a NATO member by a neighboring country. It is not hard to guess which neighboring country NATO has in mind, the Russian minister said. Such awkward scenarios are not the only thing holding back cooperation between Russia and NATO; after all, the scenario of the exercise can be re-written. According to Shoigu, there are much more serious problems: for example, the implementation of the confrontational missile defense plans in Europe; attempts to revive the old CFE treaty; deployment of NATO military infrastructure near the Russian borders; and the alliance’s enlargement policy. Meanwhile, Rasmussen told journalists that the doors of NATO are open for Georgia and Ukraine, but the two countries can only become members once they have met the alliance's criteria for membership. This is certainly not going to happen in 2014. There are, however, some problems in Russia-NATO relations that appear intractable at this moment. One of these problems is missile defense in Europe. “We have been unable to find common ground in this area,” Shoigu said. “The missile defense program in Europe is pressing ahead, and our concerns are not being taken into account. I would like to stress that we continue to seek mutually beneficial cooperation on missile defense. But, before we can begin any common missile defense projects, we need solid, reliable and legally binding guarantees that the U.S. missile defense system will not be used against the Russian nuclear deterrent,” said the Russian defense minister. “Besides, we continue to feel a lack of predictability with regard to the American and NATO plans on missile defense." For his part, Rasmussen told Russian journalists that he wanted dialogue on missile defense to become more energetic. Journalists were told in the lobbies of the NATO headquarters that the missile defense problem was too politicized for the parties to reach an agreement on any of its points; all discussions and consultations should be entrusted to experts. They must find a technically and technologically acceptable compromise that would help Russia and NATO to bridge the existing gap on this issue. Other specialists said the position of the United States was at the heart of the matter. They believe that a solution to this problem should be sought in the Moscow-Washington format, rather than between Moscow and NATO. Incidentally, at the end of his speech at the NRC meeting, Shoigu gave the NATO secretary general three small gifts — a soldier's helmet painted in traditional, flowery, Russian patterns, an open fire cooking pot, and a flask.